THE PICKIEST EATER IN THE WORLD: HANGING OUT WITH THE HALAL GUYS AT SM FOOD HALL! I have a confession to make. 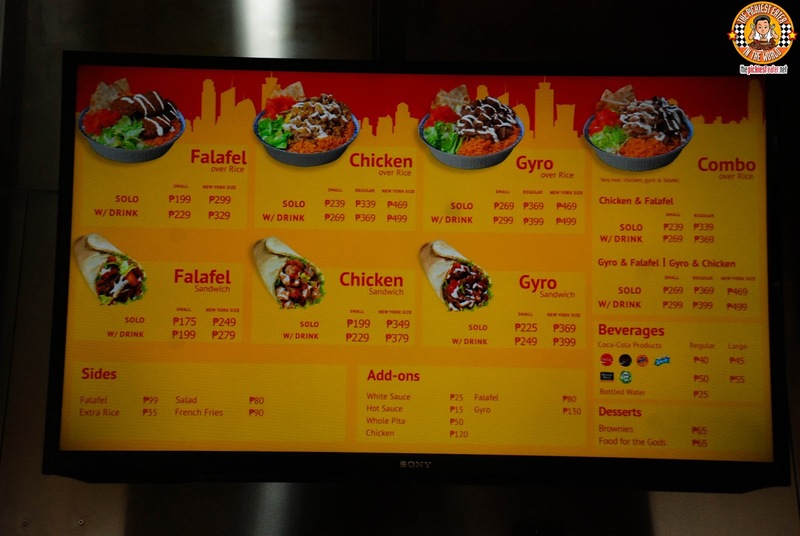 I wasn't excited about The Halal Guys coming to Manila. I mean, sure, I liked the thought of finally being able to try the dishes that thousands of New Yorkers line up for every day, but since pork is such a prominent part of my diet, I wasn't quite convinced on how much I would actually enjoy it. 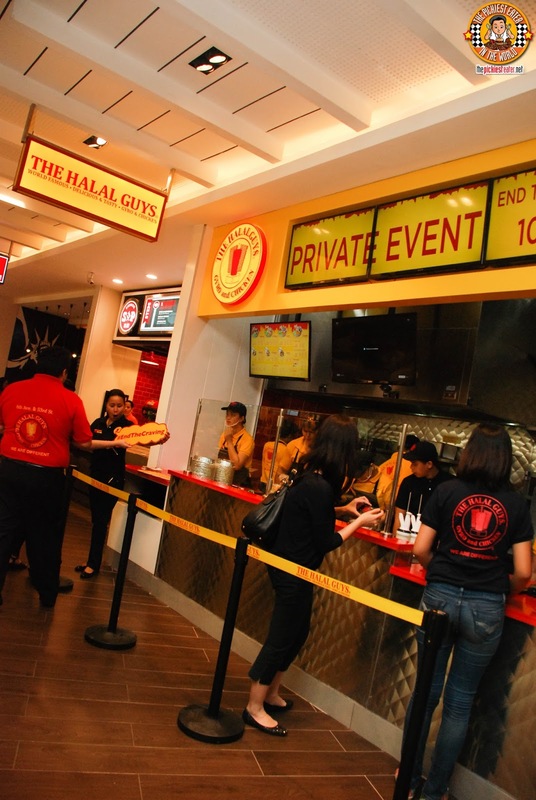 Anyway, Rina and I went to the very first "The Halal Guys" outlet in the Philippines, located at SM Mega Food Hall. Like I said, I honestly had no expectations whatsoever, right? 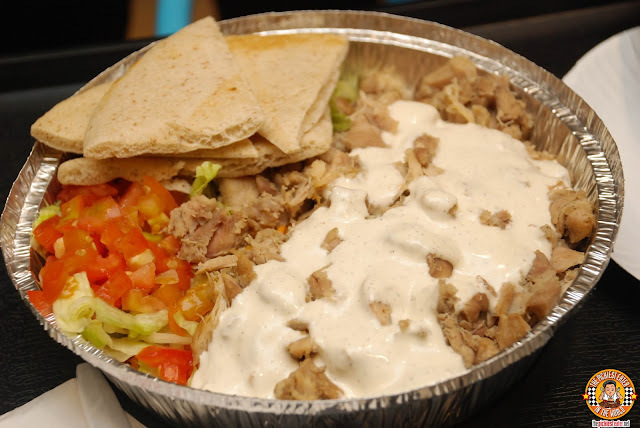 So I dug into my plate of Gyro Over Rice, scooped up some of the beef bits smothered in The Halal Guys trademark white sauce, with a spoonful of rice and nonchalantly chucked my pork-free dish into my mouth. And just like that, I stopped mid-sentence and looked straight at Rina, and said to her, "Holy $***." I had an opportunity to try The Halal Guys famous food cart in New York three years ago. It was in fact, one of the first places recommended to me by my friend, Direk Paolo, when I asked for places in the Big Apple to eat at. As luck would have it, that famous cart was located right by the hotel Rina and I were staying at, the New York Hilton. Unfortunately, every attempt we made to try the food was met with long lines.. and mind you, we tried at 1pm, 6pm and 10PM! 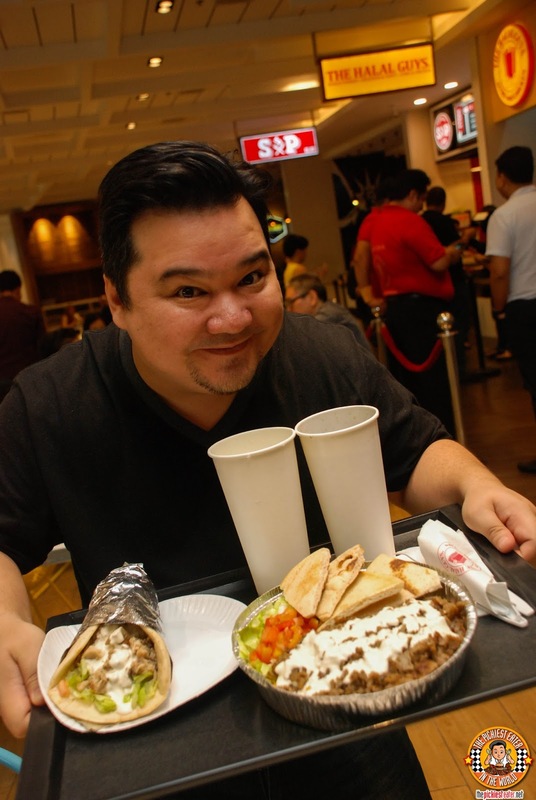 It was businessman Jaime Daez that spearheaded the arrival of The Halal Guys in the Philippines. 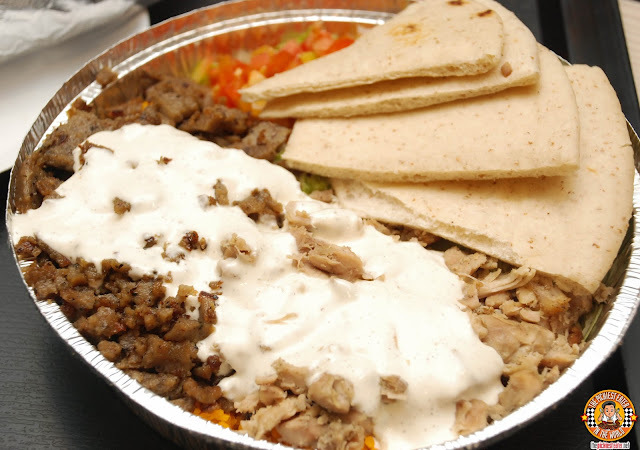 Being a big fan of the food cart, Daez would make it a point to stop over The Halal Guys whenever he was in New York. 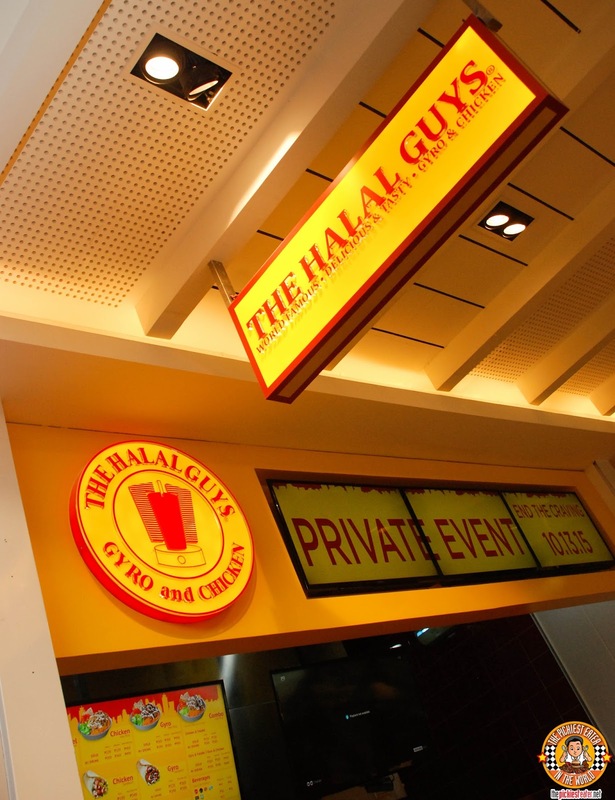 It was by sheer circumstance that he stumbled into The Halal Guys booth during a franchising expo that he visited. 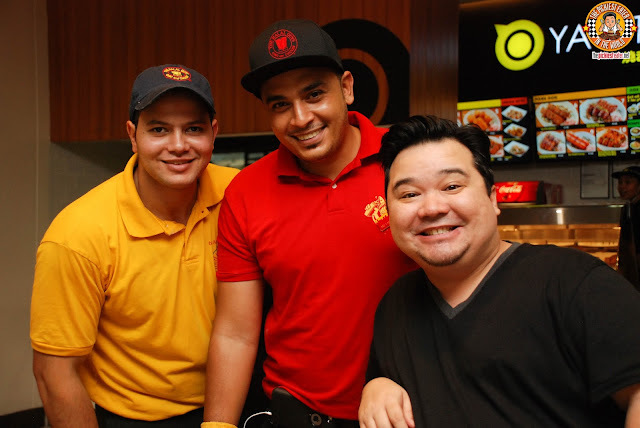 Realizing that the Halal dishes would be welcomed by Filipinos with open arms, Daez moved heaven and Earth to make The Halal Guys arrival in the Philippines a reality. 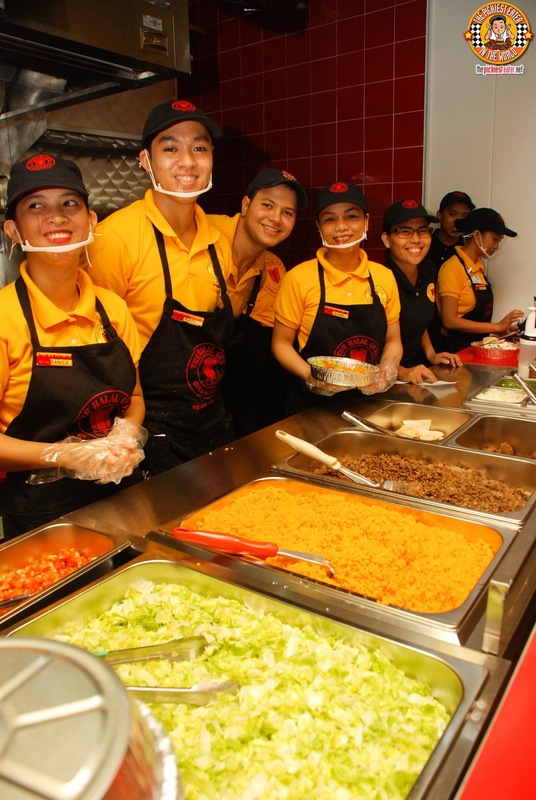 Make no mistake about it, The Halal Guys opening has been one of the most eagerly anticipated events in the Philippine foodie world. I believe the launch date was moved at least two other times, because they refused to operate without the proper Halal Certificate by the Halal Development Institute of the Philippines (HDIP) . Once I placed my order, I watched how the quick hands of the hard working crew of The Halal Guys got to work! 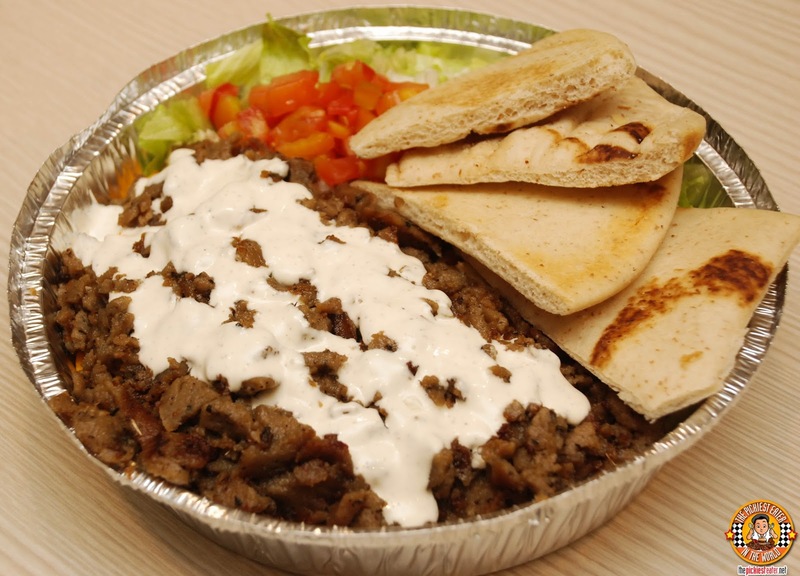 The rice, Gyro, and vegetable condiments are assembled in a round aluminum tray. Note: if ever you want to take your leftovers home, you can ask for a paper cover for it! 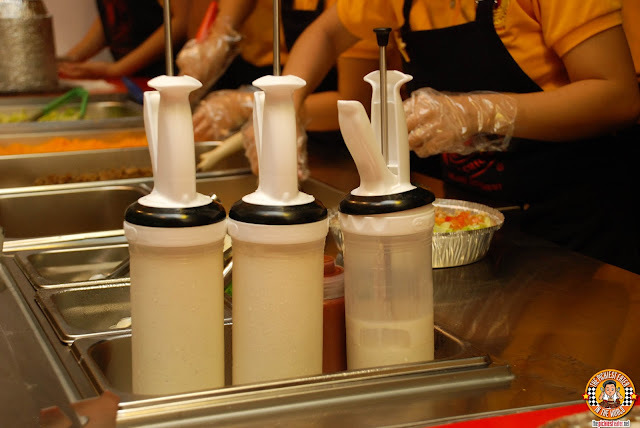 After that first "Holy $***" moment, I was tempted to steal one of these squirt pumps filled with The Halal Guys Signature White Sauce, and pump it directly into my mouth. I'm telling you, the stuff is made from everything that is right in this world. Let me tell you about the food..
First off, let me tell you about their Falafel Sandwich (Small P175/P199 with drink, New York Size P249/P279 with drink). I've actually never had a Falafel before, since I don't usually care so much for Chickpeas. However, after one bite, Rina was adamant that I had to try it, so I did and was totally blown away by how delicious it was. The ball had a curry like flavor, and had a certain savoriness to it that could possibly make you oblivious to the fact that there is no actual meat in it. 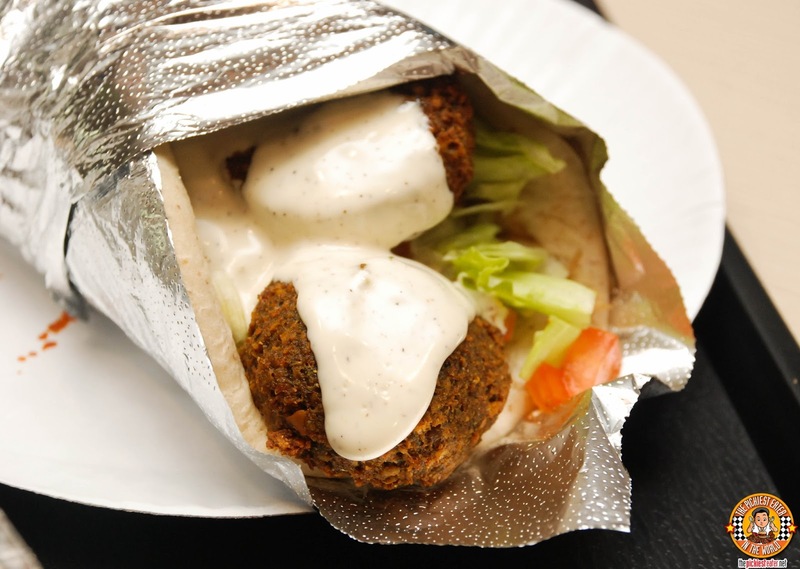 The Falafels are delicately wrapped in a toasted, yet soft pita bread blanket. The Chicken Sandwich (Small P199/P229 with drink, New York Size P349/P379 with drink) featured chunks of juicy chicken meat, bathed in that addicting white sauce, and wrapped in toasted Pita Bread. My letting loose of the expletive was caused by this dish... the Gyro Over Rice (Small P269/P299 with drink, Regular P369/P399 with drink, New York Size P469/P499 with drink). This is the dish that smacked me over the head and made me realize what all the hype was about. The gyro meat was seasoned so magnificently that it technically didn't need any sauce for it's flavor to pop, but when doused in The Halal Guy's White Crack Sauce, magical things happen in your mouth. On your platter is the meat, shredded lettuce, tomatoes, and toasted pita bread. You're actually supposed to mix everything together into one beautiful mess. But what I like about the presentation of the "Over Rice" meals, is that if you're a picky eater like me, it's easy to just attack the meat, and leave the veggies on the side. I could have asked them to omit the tomatoes altogether, but I was sharing with Rina, and not to mention I needed it to look how it's supposed to look for picture purposes. 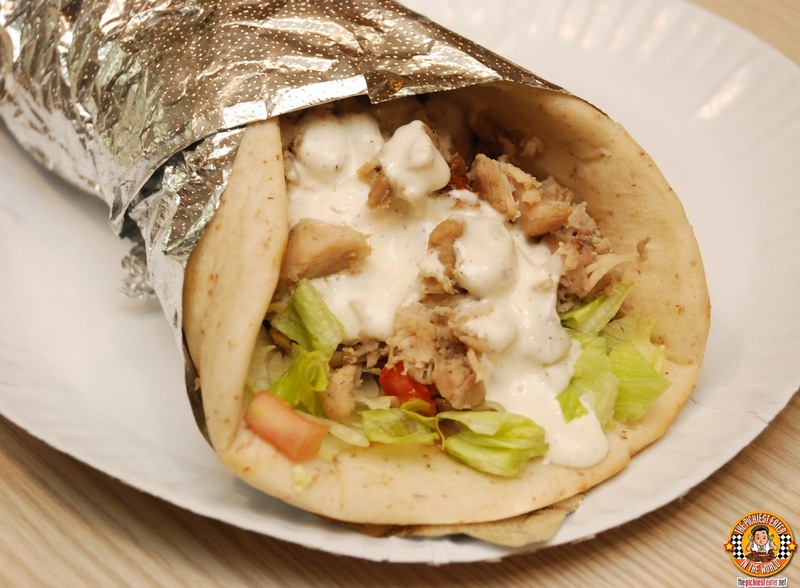 You may opt to try the Chicken Over Rice (Small P229/P269 with drink, Regular P339/P369 with drink, New York Size P469/P499 with drink), if you feel the gyro meat would be too heavy for you. And who said you had to choose just one? A Combo Over Rice Gyro Over Rice (Small P269/P299 with drink, Regular P369/P399 with drink, New York Size P469/P499 with drink) platter of both Gyro and Chicken is also available (as is a Chicken or Gyro with Falafel combo)! The Halal Guys is opening on October 13 at SM Mega Food Hall, and I assure you, their dishes are going to absolutely ROCK your taste buds! As a way of welcoming their new customers, they are giving out a Free Chicken and Gyro Over Rice Platter (with a drink) to the first 100 people that line up on opening day! Here's a tip.. make sure to always get extra white sauce!!! The more White Sauce the better!!! Oh and FYI, their Hot Sauce will make you feel like you swallowed the sun, so proceed with caution when adding it to your food! Hanging out with my new buddies, M. Omar and another member of the training staff that flew in to train the local crew! Thank you to Chuckie Dreyfus for the picture! Me and my fellow KTG buddies had a wonderful time, and I would like to thank Mr. And Mrs. Daez for including us in the guest list as one of the first to try The Halal Guys here in the Philippines! It was a fun filled afternoon of delicious food and good vibes! Follow The Halal Guys on Facebook! It's worth the wait! Don't forget extra sauce! !